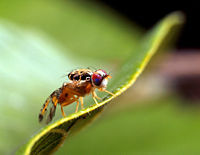 As defined by entomologists, a fly (plural flies) is any species of insect of the order Diptera. Insects of the order Diptera, known as true flies, are characterized by having a single pair of true wings, which are used for flight, while the hind wings are reduced into a pair of small knob-like structures called the halteres. In general, however, the term fly is commonly used in referring to almost any kind of small flying insect, such as mayflies, which have four wings. Diptera is a large order containing an estimated 200,000 species, although under half of these (about 85,000 species) have been described. Diptera include species labeled as flies, mosquitoes, gnats, and midges. 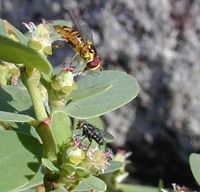 Some species are secondarily wingless (especially in the superfamily Hippoboscoidea, or those that live commensally with other species in social insect colonies). Diptera is one of the major insect orders both in terms of ecological and human (medical and economic) importance. Ecologically, diptera are very diverse and fill many roles. They may be predaceous, herbivorous, endo- and ectoparasitic, saprophagous (detritus feeders), necrophagous (feed on dead organisms), and so forth. In addition to being an essential part of food chains, some species of flies spread pollen for pollination of plants, hasten decomposition, recycle nutrients, and eat other insects. The diversity of flies and sometimes bright colors can offer an aesthetic appeal to humans as well. Flies are common among humans and some can cause the spread of serious diseases such as sleeping sickness. In particular the Culicidae family, which includes the mosquito, is of phenomenal historical and current importance as disease transmitters. The families of Muscidae (house flies), Sarcophagidae (flesh flies), and Calliphoridae (blow flies) can be annoyances and spread disease-causing pathogens. Other flies, such as the horse-fly (Family Tabanidae), can inflict painful bites. The problem with many flies is exacerbated because of a failure of human responsibility. Garbage left uncovered can attract flies and become a breeding ground for maggots. Polluted aquatic ecosystems likewise can become a breeding ground, whereas a healthy wetland system will have predators, such as fish, that can consume many of the larva before they become adults. Personal responsibility can include the practice of good hygiene, the prevention of mosquito bites through repellents and mosquito nets, and the proper care of one's body to build up resistance. In some cases, the susceptibility to fly-borne viruses reflects the need for those individuals and societies with means to help those without means, such as in meeting the cost of purchasing effective mosquito nets or vaccines. Dipterans are widely distributed, being found in tropical, temperate, and even subartic environments. The largest insects of the present day are probably the eight cm long robber flies. Flies rely heavily on sight for survival. The compound eyes of flies are composed of thousands of individual lenses and are very sensitive to movement. Some flies have very accurate 3D vision. A few, like Ormia ochracea, have very advanced hearing organs. Flies can move from one point to another point by flying, but they can also walk and run (or scurry), such as moving around a piece of fruit in search of sugar. The diet of flies varies heavily between species. The horse-fly and mosquitoes feed on blood and nectar, and the house fly eats a semi-digested liquid created by mixing enzyme-rich saliva with its food. In compound names containing "fly" for members of the Diptera order, the name is normally written as two words, as in "crane fly," though there are exceptions, such as "sandfly," "blackfly," and commonly "housefly." For insects that are members of other orders the name should be written as a single word, as in "butterfly," "scorpionfly," and so forth. The study of the Diptera is called dipterology. There are two generally accepted suborders of Diptera. The Nematocera are usually recognized by their elongated bodies and feathery antennae as represented by mosquitoes and crane flies. The Brachycera tend to have a more roundly proportioned body and very short antennae. In some taxonomic schemes, the Nematocera are divided into 77 families of which 35 are extinct (fossils only) and the Brachycera into 141 families of which eight are extinct. A more recent classification has been proposed in which the Nematocera is split into two suborders, the Archidiptera and the Eudiptera, but this has not yet gained widespread acceptance among dipterists. 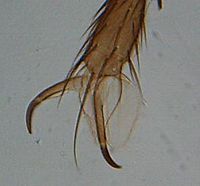 Suborder Nematocera – long antennae, pronotum distinct from mesonotum. In Nematocera, larvae are either eucephalic or hemicephalic and often aquatic. Suborder Brachycera – short antennae, the pupa is inside a puparium formed from the last larval skin. Brachycera are generally robust flies with larvae having reduced mouthparts. Infraorders Tabanomorpha and Asilomorpha – these comprise the majority of what was the Orthorrhapha under older classification schemes. The antennae are short, but differ in structure from those of the Muscomorpha. Infraorder Muscomorpha – (largely the Cyclorrhapha of older schemes). Muscomorpha have 3-segmented, aristate (with a bristle) antennae and larvae with three instars that are acephalic (maggots). Most of the Muscomorpha are further subdivided into the Acalyptratae and Calyptratae based on whether or not they have a calypter (a wing flap that extends over the halteres). Beyond that, considerable revision in the taxonomy of the flies has taken place since the introduction of modern cladistic techniques, and much remains uncertain. The secondary ranks between the suborders and the families are more out of practical or historical considerations than out of any strict respect for phylogenetic classifications. While complex, the life cycle of each fly species follows the same pattern of four distinct stages: egg, larva (commonly known as a maggot), pupa, and adult. The duration of fly life cycles, from egg to adult, vary widely with species and environmental conditions, including temperature and food. For example, the life cycle of the house fly is about seven to ten days in warm temperatures. For the fruit fly (Drosophilia melanogaster) the shortest development time from egg to adult, seven days, is achieved at 28 °C, while it takes 11 days at 30 °C, 19 days at 18 °C, and over 50 days at 12 °C (Ashburner and Thompson 1978, Ashburner et al. 2005). Different species have their own characteristics relative to mating and egg laying. Fly eggs may be laid in decaying flesh, animal dung, manure, or pools of stagnant water—generally conditions that offer ample food for the larva and commonly in a moist area. This can include both meat in trash compactors as well as rats that have died between the ceiling and floor of a home. After an egg has hatched, the fly enters the maggot stage. It begins to feed on whatever the egg was laid on, such as decomposing flesh. The maggot gorges itself with food until it is ready to enter the pupal stage, at which point the maggot travels away from the food source to an appropriate, generally moist spot. During the pupal stage, it metamorphosizes into an adult. Maggot therapy used in a small wound. Maggots, the larval phase of development of flies, provide a number of functions for the ecosystem and for humans. Ecologically, maggots are important in food chains, being consumed by a wide variety of invertebrates and vertebrates, and also are important as decomposers. Maggots have been used as a bait for fishing and as a food for reptile or avian pets. The maggots of some species of flies also provide an important medicinal role, being used for healing wounds, both historically and presently. By eating dead skin cells and bacteria, maggots introduced into a wound of a human or animal can help to clean out dead tissue and promote healing. However, maggots also can be harmful to animals and agricultural crops. Some species of maggots can burrow into the skin after being attracted to a wound and cause damage. Myasis is the infection of an animal with maggots. And diverse maggots cause damage in agricultural crop production, including root maggots in rapeseed and midge maggots in wheat. Some maggots are leaf miners. In traditional Navajo religion, Big Fly is an important spirit being. In the Hebrew language, the name Beelzebub, sometimes used as a synonym for Satan, is called Lord of the Flies (or rendered God of the fly, or host of the fly). In Greek mythology, Myiagros was a god who chased away flies during the sacrifices to Zeus and Athena. Also, Zeus sent a fly to sting the horse Pegasus causing Bellerophon to fall back to Earth when he attempted to ride to Mount Olympus. In art, extremely life-like flies have sometimes been depicted in the trompe l'oeil paintings of the fifteenth century. An example is the painting Portrait of a Carthusian by Petrus Christus, showing a fly sitting on a fake frame. Ashburner, M., K. G. Golic, and R. S. Hawley. 2005. Drosophila: A Laboratory Handbook. Cold Spring Harbor, New York: Cold Spring Harbor Laboratory Press. Blagoderov, V. A., E. D. Lukashevich, and M. B. Mostovski. 2002. Order Diptera In A. P. Rasnitsyn and D. L. J. Quicke, The History of Insects. Dordrecht: Kluwer Publ. Oldroyd, H. 1965. The Natural History of Flies. New York: W. W. Norton. This page was last modified on 8 November 2008, at 01:40.